Apple's next-generation iPad Pro models released in 2018 will feature octa-core processors, based on Taiwanese supplier TSMC's improved 7nm manufacturing process, according to Chinese website MyDrivers. The report, citing sources within Apple's supply chain, claims the eight cores in the tentatively named A11X Bionic chip will include three high-performance "Monsoon" cores and five energy-efficient "Mistral" cores. Like the A11 Bionic chip in the latest iPhone models, which is built on a 10nm process, the A11X chip will reportedly feature TSMC's integrated fan-out wafer level packaging, or InFO WLP for short. 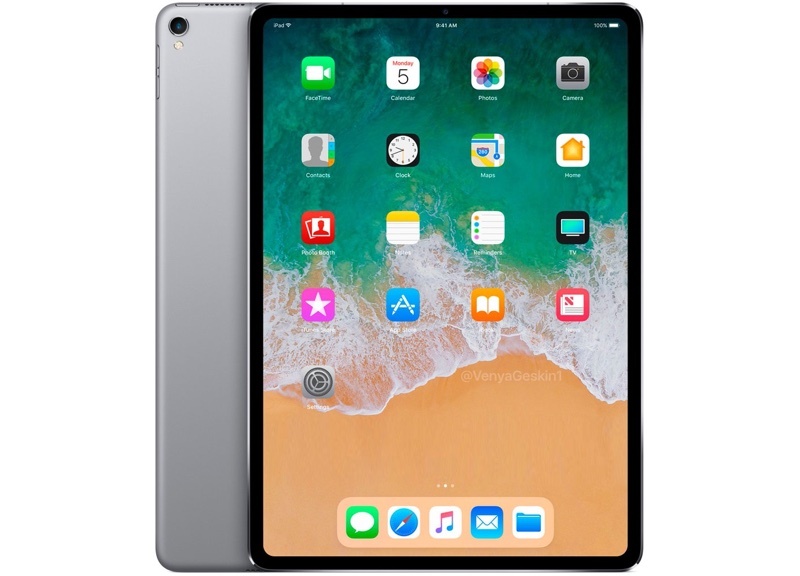 The chip will also presumably include a next-generation M11 coprocessor and neural engine for artificial intelligence tasks, such as processing facial recognition given rumors about Face ID on 2018 iPad Pro models. The eight-core processor should unsurprisingly result in CPU performance improvements on next-generation iPad Pro models. Our own Chris Jenkins provided an in-depth look at the architecture of Apple's A11 Bionic chip. He also highlighted details about TSMC's improved 7nm process and advanced InFO packaging process for 2018. Apple's current 10.5-inch and 12.9-inch iPad Pro models have an A10X Fusion chip based on TSMC's 10nm fabrication process. In addition to gaining Face ID, next-generation iPad Pro models are expected to have an iPhone X form factor with slimmer bezels and no Home button. However, the tablets will reportedly continue to have LCD displays due to yield rates. Where exactly are you supposed to grip that rendered iPad? Does the notch come as an add-on dongle? Breaking News: New generation iPad gets new generation chips. Looking forward to my next iPad Pro upgrade ;) . I still have and like my late 2015 15” rMBP, however my 10.5 iPad Pro has mostly replaced it at this point. Now that I have found good video and photo editing tools, Multi-tasking is better, and I have native file access to iCloud and Drive, I am having little need for my laptop. In some ways, the iPad Pro has become the touchscreen Mac I have wanted for years. Same way as the iPhone 10, gripping the sides. Lol what? Most people grip an iPhone with their entire hand (one hand, both sides) or rest it on their pinky. You can't do that with an iPad easily... you have to grip the edges. Does someone need to draw you a picture to understand common way of holding a phone is different than a 10" tablet? I will upgrade my Air for that. Qualcomm is already crying uncle.